Another mini variant of a popular Cherry Mobile phone has just surfaced in the market. The Cherry Mobile Flare S4 Mini is the little brother of Flare S4 which the country’s top local mobile phone brand released last October. The Flare S4 Mini does away with an MTK Octa-Core chipset and selected a Quad-Core processor by Spreadtrum instead. Personally, I don’t have the full confidence of using a Spreadtrum processor, but so far smartphones like the MyPhone my28 that uses the exact chipset of the Flare S4 Mini has produced some respectable results. Unlike the Flare S4, the Flare S4 Mini comes with Deluxe Chassis back covers similar to the ones from the Flare XL Plus. Colors are available at Black, White, Deluxe Black, and Deluxe White. 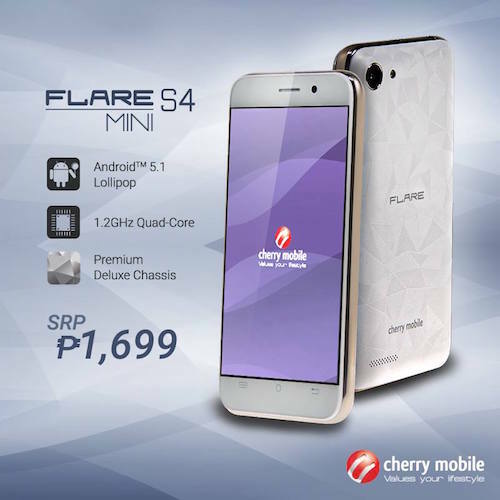 The Cherry Mobile Flare S4 Mini Price is P1,699 and is now available nationwide.